Cellusys offers downloadable resources that allow the telecommunications community to better understand industry trends, market dynamics, technology shifts and how to deploy and leverage Cellusys products and solutions. 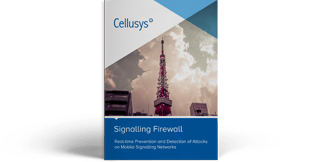 Data Sheets keep you informed about the latest features, benefits, architectures and network integrations of Cellusys products and solutions. eBooks and White Papers provide concise, comprehensive and valuable information on topics including Roaming, Network Security, SMS Security and many others.